James Dietz Handsigned and Numbered Limited Edition Artist Proof Print:"Strike on Karbala"
Size: 14.5" x 25"/ Overall Size: 21" x 31"
About the Art: Karbala is a major Shiite Muslim city 60 miles southwest of Baghdad at the edge of the Syrian Desert. Karbala is the site of the tomb of the Shiite leader Hussein, who was killed in the city in 680 AD. It is second only to Mecca as a holy place visited by Shiite pilgrims. The tomb, with a gilded dome and three minarets, is the most notable building; it was destroyed by the Wahhabis in 1801, but was quickly restored by contributions from Persians and other Shiite Muslims. The city is a holy site visited during a yearly pilgrimage of Iranian and Syrian people traveling to Mecca, which traditionally begins in Karbala and finishes in An Najef. After completing a Relief-In-Place (RIP) with the 1st Brigade Combat Team (BCT), in An Najef, Iraq at 040700L April 2003, the 2nd BCT 101st Airborne Division (Air Assault) (The "STRIKE" Brigade) went into an abbreviated planning process for an attack on Karbala to destroy remnant Saddam Fedayeen and paramilitary forces. Following the RIP, select members of the Brigade staff and the Assistant Division Commander for Operations flew to and conducted a battle handover briefing for the mission to Karbala with the 3rd Brigade, 3rd Infantry Division. Upon return, 2nd BCT executed a hasty mission planning sequence as the 101st Division Main Effort and issued a Fragmentary Order (FRAGO) at 041800L April 2003. That evening at 2100L, the Brigade TAC departed the Al Kifl base of operations and linked-up in a Position Area for Artillery (PAA) with 1-320 FA "TOP GUNS" in preparation for the next morning's attack. In addition to its organic elements, the Brigade was augmented with 2-70 AR, 1st Armored Division; C/1-41 IN (M), 3-101 Attack Aviation; and 2-17 CAV. Artillery support included 1-320 FA, 3-320 FA and C/1-377 FA, including a battery of MLRS from C/2-37 FA. Total artillery assets consisted of 36 guns, 2 launchers, and 3 radars. In total 2nd BCT consisted of 10 battalions. The plan required a Ground Assault Convoy (GAC) move up Highway 9 with a simultaneous air assault from a series of PZs around Al Kifl into three LZs around the city. For the operation Karbala was divided into 4 zones and then sub-divided into 30 separate sectors sequentially lettered from A through DD. The Brigade Main Effort, 3-502 Infantry, departed from PZ BIRCH and landed to the northwest of Karbala on LZ SPARROW and was tasked to destroy a company plus of Fedayeen fighters. Supporting the brigade main effort was 1-502 Infantry, which departed from PZ PINE and landed to the southeast on LZ FINCH. Also in support was 2-502 Infantry, which departed from PZ MAPLE and landed to the southwest on LZ ROBIN. The plan called for the infantry to clear its assigned sectors with 2-70 AR, positioned to the east of the city, responsible for tightening the noose along the key re-supply routes to Baghdad; aviation and artillery units were in support. H-hour was set for 051100L April 2003 and began with a half-dozen airstrikes using satellite-guided Joint Direct Attack Munition (JDAM) bombs against paramilitary arsenals. 23 UH-60 Black Hawk helicopters and 5 twin-rotor CH-47 Chinooks shuttled three 502nd Infantry battalions (a total of 731 soldiers) into their respective landing zones around the city. Then, in swirling dust and over 102 degree heat, 28 M1 Abrams tanks and 16 M2 Bradley Fighting Vehicles roared in from the east and northeast along Route Venezuela -- a hammer against the infantry anvil. Resistance was heavy. The infantry battalions soon found themselves immersed in street clearance against a determined, but unstructured enemy, armed with an array of militia weapons. 3-502 IN (ME) bore the brunt of it. Its companies had entered the city after an unexpectedly long approach march from LZ Sparrow and, once inside, became embroiled in a series of skirmishes that demanded junior leadership of the highest standards. Further south, 2-502 IN moved in similarly methodical fashion, street-by-street, building-by-building. Stockpiles of arms were found in schools and homes. 1-502 IN, pressing in from the southeast of the city, denied the enemy access to multiple caches. 2-17 CAV provided brave and unquestioning support in destroying targets hindering the infantry's advance by either independent action or by marking targets for artillery and Close Air Support (CAS) to engage. By nightfall, 2nd BCT had cleared and secured 13 of their 30 sectors. It had secured a frightening amount of weaponry, including 2 ZPUs, 5 S60s, 14 mortar systems and 36 RPG launchers. It found a possible terrorist training camp, replete with bunkers, obstacle courses and planning tables. Artillery batteries fired more than 100 smoke canisters to screen infantrymen moving onto the streets. Through the next day 2nd BCT infantry units cleared the remainder of their sectors, at times still encountering resistance. Each and every school system was found to contain some sort of weapons cache, Saddam Hussein propaganda, and evidence of foreign insurgent assistance. Ba'ath Party Headquarters were stocked with "Oil for Food" rice and flour bags, as well as audio/video and Pro-Hussein political paraphernalia. Karbala was considered cleared of any subversive elements and deemed secure by 061700L April 2003. At aproximately 061730 April 2003, the 20 foot steel molded statue of Saddam Hussein was symbollically torn from its pedestal by elements of the 2-70 Armor battalion and the Iraqi people. Though the Brigade departed Karbala on 071600 APR, 1-502 IN battalion remained in the city until 10 April to conduct a RIP with the 2nd Brigade from the 82nd Airborne Division. The "STRIKE" Brigade suffered multiple casualties including the death of SPC Larry Brown of C/1-41 IN (M), who died when an RPG hit his Bradley. Hundreds of enemy, mostly Syrians and militia fighters, had been killed. Scores of caches had been discovered and consolidated at the Brigade Supply Area (BSA) resulting in a large international media presence in the city on 7 April. The Battle for Karbala was a successful execution of joint warfare using a combined-arms capability in an urban environment. It was the premier battle of the war for the 2nd BCT. 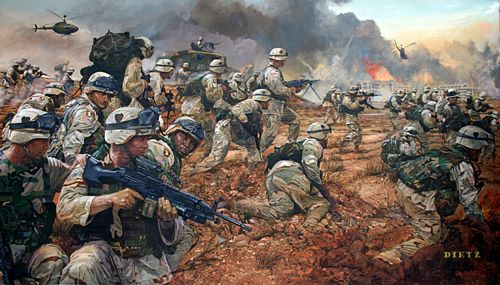 The actions of the 2nd BCT eliminated Iraqi attacks on V Corps Lines of Communication (LOC) and allowed the attack toward Baghdad to continue unhindered.